If you are in the market to getting your hands on a couple of new batteries, then you might want to consider getting your hands on these. The 40A Flat Top 3.7V Battery by iJoy is one that is impressive as it lasts you a long time. A team that has been in the vaping game for a long time created this product, so there is no surprise why many people are making it a priority to get their hands on this battery. 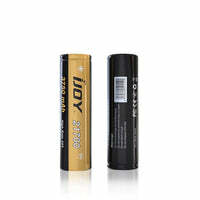 This is a 20700 battery that is compatible with many box mods that require batteries. It has Li-Ni high drain construction that is going to allow it to be durable and long lasting. The battery capacity is going to be a heavy 3000mAh, which will certainly last you a long time. It is also going to have a nominal voltage of 3.7V, a peak voltage of 4.2V, and a cut-off voltage of 2.5V. The maximum continuous discharging current is 40A, and the maximum pulse discharging current is 85A. This battery is going to have your typical flat-top design that most batteries have, so nothing new that you may not be used to. This is an amazing battery that is going to change the way you vape. 40A Flat Top 3.7V Battery - iJoy has a rating of 5.0 stars based on 1 reviews.